Cristian takes on the classic B'wave plot, and comes up with creative ideas for making it a highlight in any magic show or mentalism act. He touches on close-up and stage performances, and adds unique twists designed to stun modern audiences. 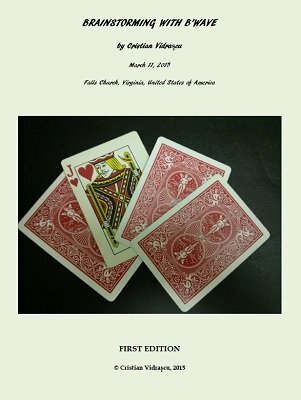 Hidden among the unique presentations are ways to turn an entire, previously examined deck of cards into a blank deck (no deck switch), or how to predict a number simply thought of by a spectator (nothing written down, no pre-show work or verbal forces) - all in the context of the B'wave plot. As seen in his previous work on the Invisible Deck , his presentations are quite different and innovative. 1st edition 2015, 28 pages.